The main difference between ID and superego is that ID contains the basic needs, sexual drives and hidden memories whereas superego contains the moral conscience. 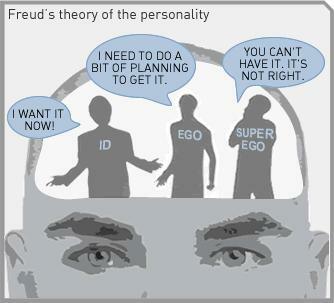 ID and superego are two components of the Freud’s model of the psyche. Accordingly, ego functions as the mediator in between ID and superego. In addition to the main functions of these two, ID is regarded as the most primitive and instinctive part of the mind. Sigmund Freud is considered the father of psychology, and he formulated a model for human psyche in 1923. Accordingly, Freud explained the human psyche or the human personality as structured mainly of three parts: ID, Ego and Superego. All three parts develop at different stages in a person’s life. ID and super-ego are mediated by ego that acts based on the reality. Ego is, therefore, well-organized and mediates between id and super-ego and makes realistic conclusions accordingly. It is the part that tries to meet the desires of the id and the moral attributes of the superego in a socially acceptable way. Nevertheless, it is important to note that all these are psychological components, not biological or physical components. According to the Freud’s model, the first component is ID. ID functions as the most primitive and instinctive part of the mind that contains the basic needs and desires of a person. In addition to these desires, it also consists of hidden memories. Consequently, if these needs, wants and drives are not satisfied, a person experiences aggression and tensed bodily reactions. ID is responsible for these reactions. 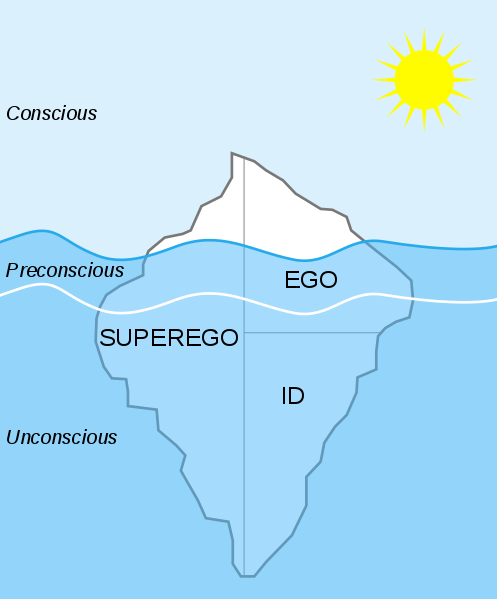 The ice-berg theory of the Freud’s psyche model emphasises that ID resembles the unconscious mind where all human hidden desires, thoughts, and memories are present. Hence, ID functions according to the pleasure principle; the principle of gratification of needs and achieving pleasure through that. Consequently, ID works as the impulsive part of the human psyche that directly gets influenced and responds immediately to biological instincts. Freud explained the nature of ID as “dark, inaccessible part of our personality… we call it a chaos, a cauldron full of seething excitations. …It is filled with energy reaching it from the instincts, but it has no organization, produces no collective will, but only a striving to bring about the satisfaction of the instinctual needs subject to the observance of the pleasure principle..” in his book ‘New Introductory Lectures on Psychoanalysis (1933)’. For instance, consider a situation where a person in inside his workplace and is extremely hungry; this biological drive is carried out by the ID and the immediate response to it, i.e., the need to satisfy hunger by eating through any means. This is the immediate response given by the ID. However, ID is important to human survival since it is responsible for the responses to basic urges that are necessary for human survival. Hence, it also provides all the essential energy to drive the personality. Superego is the third component of the human psyche as described by Freud. Accordingly, super-ego contains the moral attributes of a person. It plays the part of the critical analysis and the moral advice in mind. Superego acts as the morally organized constituent of the personality that includes the person’s spiritual ideals and psychic conscience (which criticizes and hinders the immediate reactions for primitive drives, actions and feelings, etc.). Freud explained that the formation of superego happens as a result of the helplessness of the child and the stage of his/her Oedipus complex, i.e., after the child learns to identify himself with his father. Afterwards, it continues to develop through his adolescence, where the cultural superego also imposes cultural, moral norms on the superego. 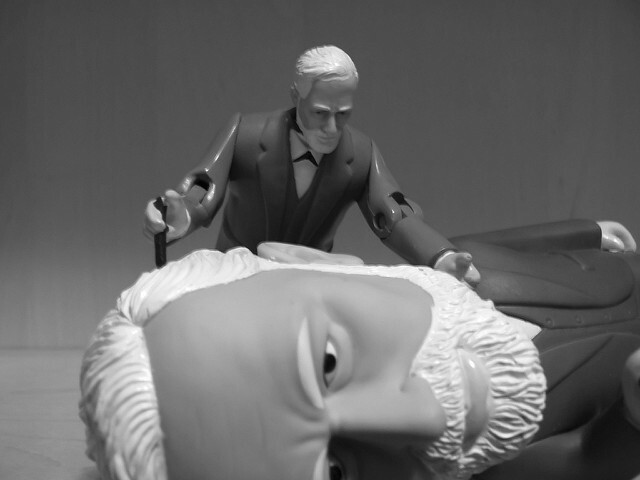 To quote Freud on superego, he said ‘the installation of the super-ego can be described as a successful instance of identification with the parental agency… and the super-ego also takes on the influence of those who have stepped into the place of parents — educators, teachers, people chosen as ideal models “. It, therefore, develops as a result of the moral guidance obtained by a person with the commencement of their social interactions, such as with family, educators and spiritual leaders and other social interactions. To expand the previous example situation, when a person is very hungry, and he sees someone else’s food, ID will immediately push him to eat it no matter whose food it is and where he is now (in the workplace), but superego will say it is immoral and not ethical since it shows his primitive and uncivilized quality to steal someone else’s food even though he is utterly hungry. The ego will mediate between these two and make a realistic conclusion as either to go out and buy food or to consider some other alternative that will not ruin his image. This is the difference between ID and superego in a practical situation. ID and Superego are two of the three components of the human mind or personality according to the Freud’s model of the psyche. They both function side by side each other, and are mediated by ego. ID refers to the most primitive component of the human psyche or human personality that contains sexual and aggressive desires. On the other hand, superego is the third component of the human psyche or personality that contains the moral attributes. Hence, this explains the main difference between ID and superego. ID functions in relation to the pleasure principle; it motivates primitive human desires such as likes, wants and sexual drives to be gratified. In addition, it also contains the hidden memories of a person. On the contrary, super-ego provides critical analysis followed by moral advice. This is a major difference between ID and superego. Their development is another main difference between ID and superego. ID is the most primitive part of the human psyche. Thus, it is developed from a person’s birth and is present throughout a person’s life. On the other hand, super-ego is developed as a result of a child’s Oedipus complex and his/her with the social interactions during his/her adolescence (especially family and other sources of moral guidance), where he/she identifies and assimilates accepted moral standards into his/her personality. ID is significant as it acts as the driving force of a person’s personality. It not only strives to fulfil the basic human urges, and it also provides all necessary energy to drive personality. Superego, on the contrary, is significant as it acts on the critical analysis based on the person’s acquired moral guidance. 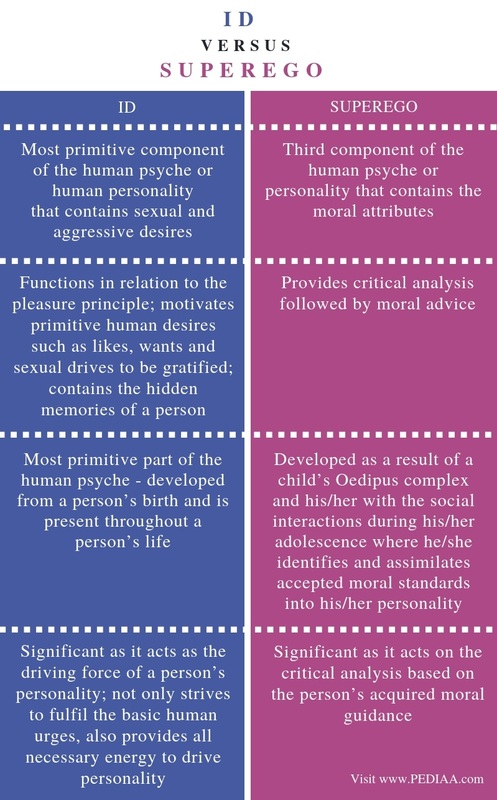 Freud’s model of psyche explains three basic components in the human mind or personality. These three components are id, ego and superego. ID is the most primitive part of the human psyche that contains the basic human urges and hidden memories while superego is the moral conscience of a person that provides suitable moral guidance and critical analysis. This is the main difference between ID and superego. In between id and superego ego works as the mediator of these two. 1. Mcleod, Saul. “Id, Ego and Superego.” Id Ego Superego | Simply Psychology, Simply Psychology, 5 Feb. 2017, Available here. 2. Cherry, Kendra. “The Id: Understanding Our Dark Side.” Verywell Mind, 3 Oct. 2018, Available here. 3. “Id, Ego and Super-Ego.” Wikipedia, Wikimedia Foundation, 22 Oct. 2018, Available here.